Simple but well detailed kit with detailed cabin interior. Hardware is provided to fit an optional Mabuchi RE-260 electric motor. Headlights and taillights can be fitted with optional lightbulbs. The headlights come with a working pop-up mechanism, the front wheels can be made to steer and the rear hatch can be lifted open. Interior tub comes with seats, accurate dashboard and steering wheel, center console with shifter and handbrake lever and rear seats. Headlight lids, bonnet and doors have thinned down lines around the edges to ease cutting them out of the body. Separate clear parts for the front and side indicator lights and black inserts for the bumper strips are included. This first release comes with headlight lids and bonnet molded flush in the nose, and with an insert piece for the engine bay containing a nice rendition of the 12A engine. Body is molded in white, wheels, exhaust tip and rear view mirror are brightly plated, all other parts are molded in black, tires are rubber-like and have Michelin XZX legends and authentic thread pattern. Decals contain license plates, Mazda logos, a set of yellow/green racing stripes and other stuff to dress the car up as a street racer. 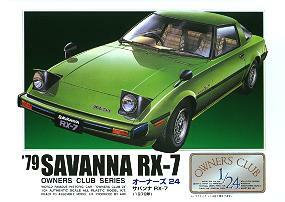 This second release was modified but retained the same catalog number (C-520), the headlight lids are now cut out of the nose and provided as separate parts (attached to the rear of the roof) and the engine bay insert and bonnet hinge parts are replaced by a 4-part driver figure. Body is now molded in green (as are the headlight lids), all other parts are the same as the previous release, as are the decals. The LS kit was released a third time, this time only the catalog number (now C-551) and the box art were changed. 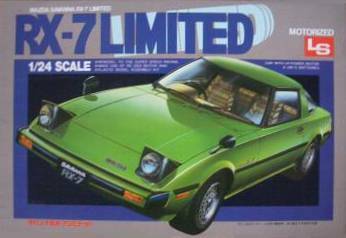 This version was also released in the USA by Scale Craft. 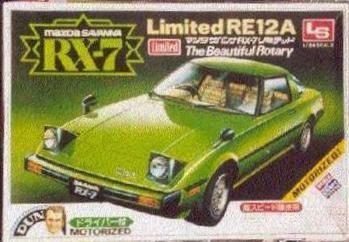 After the LS company folded, ARII (currently 'MicroAce') acquired the molds and released the RX-7 along with some other former LS kits in its Owners Club Series. 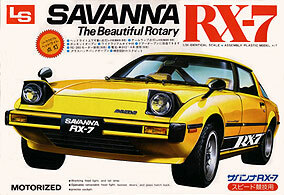 A tiny set of decals is included with 'Savanna RX-7' showroom plates and japanese road tax stickers.